Myer will extend its digital hub pilot across top stores nationally and is bolstering its brand portfolio to win over high-value customers under its $600 million transformation agenda. In a presentation to investors today, Myer CEO, Richard Umbers, detailed the retail group’s ‘New Myer’ strategy, outlining four key pillars for turning the business around: Customer-led offers, wonderful experiences, omni-channel shopping and a productivity step change. The retailer plans to invest more than $600m into its five-year transformation plans, including $150m into product placements and experiences and $200m into omni-channel capabilities. “There is a significant opportunity to deepen our relationship with our customers,” Umbers said. He pointed out the size of customer wallet in the categories Myer operates in is $63 billion, yet the retailer currently has just a 5 per cent share. While Myer’s strategy was historically based on solid retail fundamentals, the new retail context makes it much less relevant today, Umbers continued, particularly in the face of digital disruption, the globalisation of retail, specialty retail competition and demographic change. As part of his presentation, Umbers pointed to substantial research Myer has undertaken into its MyerOne loyalty customer base, as well as its use of Roy Morgan data on Australian customer retail segments, to identify its key customers. He outlined the top three as: High value consumers, or those who are up to date with fashion, are family-oriented, professionally successful and have an interest in brands and quality; fashion forward, or those who lead the fashion pack; and affordable fashion, or those looking for better everyday value. “Modern retail is about connections with individuals,” Umbers said. For example, he noted high-value shoppers are 60 per cent more likely to have a preference for the department store, have a total annual average spend of $4600 per person, and spend two times the average of other customers. It’s also about embracing digital to build rapport with customers. According to Umbers, omni-channel customers are worth more than twice as much as those who just shop in physical store, and seven times as much as someone who shops online only. He also noted that Myer’s online sales last year were up by 80 per cent. “We have to be able to deliver omni-channel into people’s homes and devices but also then seamlessly to the store, and then to life in-store,” he said. One growing area of digital capability for Myer is click-and-collect, and Umbers saw click-and-collect sales reaching 30 per cent of total online sales for the retailer in the near future. Another major investment is in Myer’s digital hub, which combines digital with the in-store experience. Thanks to the successful pilot of the service in its Parramatta store in July and August, Myer now plans to roll out the hub to all of its major stores nationally. 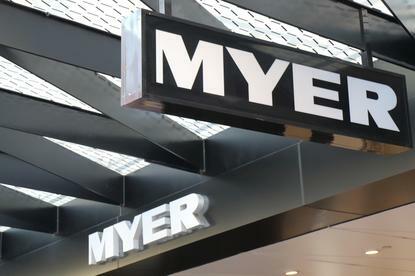 To support its plans, Myer has made a number of executive changes including the appointment of Gary Williams as chief transformation officer to lead the change efforts. Mark Cripsey, who was appointed last week as the company’s new chief digital and data officer, is also a reflection of the emphasis on digital and new channel, Umbers said. Dramatic change is also occurring in Myer’s brand make-up, with a number of premium brands coming into the mix including Seed, Toms and latest exclusive addition, Topshop and Topman. As part of the new deal with Topshop, Myer has taken 25 per cent stake in the Australian franchisee for the retail brand, Austradia, and will start with a 20-store rollout, with the first store due to be live by November. “This is a time of massive change and reinvention of the business and you’ll see that most in the touchpoints to the customer,” Umbers added. Myer MD of merchandising and marketing, Daniel Bracken, then outlined a shopping list of priorities to investors to support its more targeted customer efforts. This included a better balance of premium third-party and Myer exclusive brands, cross-departmental selling, localisation of merchandise based on geographic location, experience-led in-store improvements. “We have 7 per cent of Eva’s wallet in total but interestingly, it’s 26 per cent in cosmetics,” Bracken said, attributing this to the combination of great brands, local and international suppliers, knowledgeable staff and brand-led fitouts that are instantly recognisable. Bracken also flagged several new categories Myer has its sights on such as athletics/leisure and the connected home, along with a store and brand optimisation strategy that’s better aligned to the high-value customer the retailer is targeting. In line with Myer’s stronger emphasis on digital, Bracken is placing a stronger focus on digital marketing and communication to its targeted customer segments. “Now we have greater knowledge of our customer, and know she’s incredibly focused in the digital space, we have to increase our investment in the digital space,” Bracken said. “We have to take our conversations to where she wants to have conversations with us. Bracken stressed the need for Myer to focus now just on sales-led marketing activities, but brand building as well. None of this comes without rationalisation, however, and Umbers said up to 20 per cent of the Myer physical retail footprint nationally could be dropped as it looks to have a more productive store network. Myer also recently can 80 staff from its head office, and is looking to optimise its supply chain in line with its smaller footprint. As a result of its five-year plan, Umbers said the group is aiming for positive growth by FY17, and is targeting average sales growth greater than 3 per cent between 2016-2020.